In these past few weeks, I have been exploring professional development (PD) models that optimize adult learning. The primary focus of these posts has been on the characteristics of adult learning and various professional development formats that honor these characteristics. While understanding these models is important so that participants gain the most out of their professional development, in this post I’d like to focus on applying these concepts to incorporate content, exploring educational technology best practices described in the ISTE coaching standard 4b: “Design, develop, and implement technology rich professional learning programs that model principles of adult learning and promote digital age best practices in teaching, learning, and assessment,” (ISTE, 2017). In investigating digital age best practices, formative assessment appeared as a reoccurring theme. Formative assessment as part of a feedback loops empowers learners to engage in the trial and error of learning safely and with minimal risk. Applying formative assessment to professional development could offer similar results. 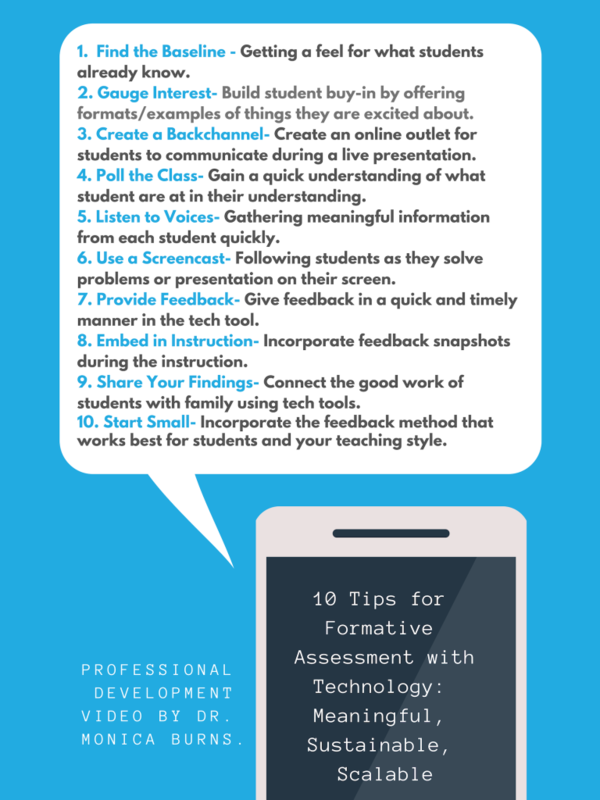 In applying this idea to the ISTE standard, I began wondering what digital tools could be implemented to teach teachers about the importance of formative feedback? What is “Formative Assessment” and why is it a best practice? I explore the benefits of feedback loops for students in this post, I’d like to expand the investigation to including formative feedback as a tool in adult learning. The Office of Educational Technology found that formative feedback when coupled with technology tools may be more complete than traditional assessment and may “reduce time, resources, and disruption” to conduct the assessment, (Office of Educational Technology, n.d.) These benefits help educators as formative assessment may provide an avenue for capturing teaching qualities that open opportunities for “self-reflection, peer reflection, feedback, and supervisor evaluation,” (Office of Educational Technology, n.d.). Extending these concepts further, formative assessment can be used in professional development as a means to inform instructional practice where participants track their own learning, (Office of Educational Technology, n.d.). This means that meaningful evaluation can occur more rapidly and frequently, offer more insight, and help guide professional development needs. Tech tools that can be used for formative assessment. There are several educational technology tools that can be used for formative assessment. Common Sense Education created a list of the top 27 tools for formative assessment available here. These formative feedback tools include the following features: student progress tracking, interactive and collaborative activities, student-paced learning, and instant feedback to both students and teacher. Formative feedback is given by utilizing interactive slideshow presentations, video responses, multi-multimedia platforms, content-mapping, quizzes (including clickers and polling), and backchannel chats. In creating the list, Common Sense Education agrees with the Office of Educational Technology stating that the best formative assessment tools help students (and participants in this case) self-reflect and assess so that they understand their current level of learning and self-identify areas of improvement, (Common Sense Education, n.d.). Integrating formative assessment into professional development. Incorporating formative assessment in adult learning must assume that participants are learners who are joining the professional development for a variety of different motives that are relevant to their work situations. Though are quite a few professional development resources available on the internet on formative feedback tools, I’d like to use this professional development video I found through YouTube entitled, “10Tips for Formative Assessment with Technology: Meaningful, Sustainable, & Scalable” as an example. In the video Dr. Monica Burns walks participants through her tips by highlighting main features and how to use some formative feedback tools. A summary of her tips is provided in figure 1.1 below. Though the video is purely informational as Dr. Burns lectures for about 30 minutes on her ten tips, this could be a useful resource for participants that are highly motivated. The professional development model used assumes that the participants already have an awareness of formative assessment and simply need guidance or ideas on how to implement this in their teaching practice. 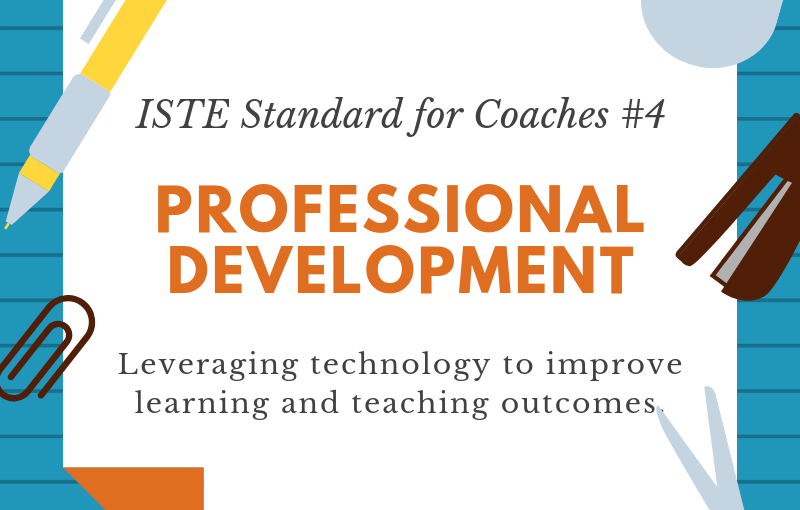 According to the ISTE standard, best practices for the effective PD includes modeling, (ISTE, 2017). While the workshop above may model ways to use each tool through verbal and visual description, it fails to include participant buy-in and interaction. Formative feedback could have been included into the professional development itself, allowing participants an opportunity to experience instant feedback through the lens of a learner. For example, demonstrating how to gauge comprehension to better understand the audience’s needs could have been accomplished by using a backchannel chat or using the polling/quizzes apps described in the video. This tangible and experiential approach could help increase self-efficacy of technology tools for mixed audiences where the presenter modifies their role to facilitation at certain periods of the professional development. When presenters start thinking about their participants as learners, professional development becomes stronger, more impactful which can yield better improvements in teaching and learning. Vlad-Ortiz, C. (2018). Instructional coaching: Using rubrics to quantify qualitative data for improved teaching outcomes. Previous Previous post: Honoring Adult Learners: Could a Facilitator Model Improve Professional Development Outcomes? Next Next post: An Administrator’s Role in Professional Development Implementation.